The modern canon of scripture does not record Mary's birth. The earliest known account of Mary's birth is found in the Protoevangelium of James (5:2), an apocryphal text from the late second century, with her parents known as Saint Anne and Saint Joachim. In the case of saints, the Church commemorates their date of death, with Saint John the Baptist and the Virgin Mary as the few whose birth dates are commemorated. The reason for this is found in the singular mission each had in salvation history, but traditionally also because these alone (besides the prophet Jeremiah, Jer 1:5) were holy in their very birth (for Mary, see Immaculate Conception; John was sanctified in Saint Elizabeth's womb according to the traditional interpretation of Lk 1:15). Devotion to the innocence of Mary under this Marian title is widely celebrated in many cultures across the globe. The Infant Mary wrapped in swaddling clothes. Museum of Valenzuela City, Philippines . The "Protoevangelium of James", which was probably put into its final written form in the early second century, describes Mary's father Joachim as a wealthy member of one of the Twelve Tribes of Israel. He and his wife Anne were deeply grieved by their childlessness. Pious accounts place the birthplace of the Virgin Mary in Sepphoris, Israel where a 5th-century basilica is excavated at the site. Some accounts speak of Nazareth and others say it was in a house near the Sheep Gate in Jerusalem. It is possible that a wealthy man such as Joachim had a home in both Judea and Galilee. However, Charles Souvay, writing in the Catholic Encyclopedia, says that the idea that Joachim possessed large herds and flocks cannot be asserted with certainty, as the sources for this are "...of very doubtful value....". Tradition celebrates the event as a liturgical feast in the General Roman Calendar and in most Anglican liturgical calendars on 8 September, nine months after the solemnity of her Immaculate Conception, celebrated on 8 December. The feast is also included in the Tridentine Calendar for 8 September. This date is also used in the Western Rite Orthodox Church. The Byzantine Rite Orthodox likewise celebrate the Nativity of the Theotokos on 8 September. The Syriac Orthodox Church, like its closely related sister church, the Byzantine Rite Antiochian Orthodox Church, also celebrates the feast on 8 September. For churches using the old Julian Calendar for liturgical purposes September 8 falls on September 21 of the Gregorian Calendar. In other words, "Old Calendar" Churches, such as the Russian Orthodox Church, still celebrate the Nativity of the Theotokos on the 8th, but the day is actually the 21st according to the everyday calendar used by society at large. The Armenian Apostolic Church also uses the traditional date of 8 September. Yet the Coptic Orthodox and Ethiopian Orthodox Christians celebrate it on May 9 (1 Bashans, EC 1 Ginbot). The earliest document commemorating this feast comes from a hymn written in the sixth century. The feast may have originated somewhere in Syria or Palestine in the beginning of the sixth century, when after the Council of Ephesus, the cult of the Mother of God was greatly intensified, especially in Syria. The first liturgical commemoration is connected with the sixth century dedication of the Basilica Sanctae Mariae ubi nata est, now called the Church of St. Anne in Jerusalem. The original church built, in the fifth century, was a Marian basilica erected on the spot known as the shepherd's pool and thought to have been the home of Mary's parents. In the seventh century, the feast was celebrated by the Byzantines as the feast of the Birth of the Blessed Virgin Mary. Since the story of Mary's Nativity is known only from apocryphal sources, the Latin Church was slower in adopting this festival. At Rome the Feast began to be kept toward the end of the 7th century, brought there by Eastern monks. The church of Angers in France claims that St. Maurilius instituted this feast at Angers in consequence of a revelation about 430. On the night of 8 September, a man heard the angels singing in heaven, and on asking the reason, they told him they were rejoicing because the Virgin was born on that night; but this tradition is not substantiated by historical proofs. The winegrowers in France called this feast "Our Lady of the Grape Harvest". The best grapes are brought to the local church to be blessed and then some bunches are attached to the hands of the statue of Mary. A festive meal that includes the new grapes is part of this day. In Goa, the feast of Mary's Nativity, called the "Monti Fest", is a major family celebration, serving as a thanksgiving festival blessing the harvest of new crops, and observed with a festive lunch centered on the blessed grain of the harvest. In Mangalore it is the feast of Mary's Nativity, called the "Monthi Fest". On this day every Mangalorean eats pulses and vegetables. The priest blesses a branch of grain which is added to food. Before the feast on 8 September there are nine days of novena followed by the throwing of flowers on baby Mary's statue. Holy card depicting the birth of the Blessed Virgin Mary. University of Dayton Libraries. Nativity of Mary, Spain, 17th century. The scene was frequently depicted in art, as part of cycles of the Life of the Virgin. Medieval depictions of Mary in infancy often include her birth by Saint Anne. In late medieval depictions the setting was often in a wealthy household. In 1730, devotion to Mary in her first infancy among the Franciscan nuns in Lovere, Italy, where a wax statue of the Santissima Maria Bambina was venerated and later brought to Milan under the care of Sisters of Charity. In Southern France, the devotion penetrated into the bride gift wedding custom of Globe de Marièe, where the baby Mary is placed on the cushion, representing children and fertility as one of the ideal wishes of a newlywed bride. 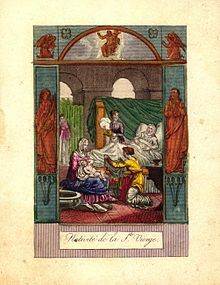 A similar devotion showcasing the toddler years of Mary began to develop, mainly in former Spanish territories such as Mexico, Guatemala and the Philippines, where the La Niña María is portrayed as a prepubescent girl. In 19th-century Mexico, the Conceptionists nun Sister Magdalena endorsed a devotion to the infant Virgin, using the Cabeza or head of a cherub angel from a damaged monstrance to create a Santo image. Later, Marian visionary, Rosario Arrevillaga, began a religious order devoted to the same Marian title called the Order of the Slaves of the Immaculate Child. Pope Benedict XV recognised the Marian image in Senglea, Malta under the title of Maria Bambina honouring the nativity of the Virgin Mary, granting the decree of its canonical coronation on 1 May 1920, subsequently crowned by Archbishop Mauro Caruana on 4 September 1921. The image which once adorned a Catholic galleon was shipwrecked in 1618 near the Dalmatian islands and was rescued to the present town, which also celebrates its feast on September 8. In the Philippines, pious Catholics adopted the same devotion to the toddler Virgin, dressing her in pastel colours and crowning her with flowers to emphasise her virginity and innocence, as opposed to the traditional diadem reserved for images of adult saints. Similar to Hispanic traditions, candies and cakes are popularly offered in the infant Virgin's honour, emphasizing her honorific title as La Dulce María or the Sweet Mary. On 27 December 2018, the House of Representatives of the Philippines officially approved bill #7856, in honor of the Virgin Mary’s birthday for September 8 as a working holiday. The Nativity of the Blessed Virgin Mary Cathedral is located in Biloxi, Mississippi. There is also a Cathedral of the Nativity of the Blessed Virgin Mary in Juneau, Alaska. The Nativity of Mary, Blessed Virgin Catholic Church in High Hill, Texas is an historic church built in 1906. The Nativity of the Blessed Virgin Mary Parish in Lorain, Ohio was founded in 1898 to serve the Polish-American community. Nativity of Mary Catholic Church and School is located in Bloomington, Minnesota and is part of the Archdiocese of Saint Paul-Minneapolis. The Nativity of the Virgin Mary Orthodox Church in Madison, Illinois is part of the Orthodox Church in America Diocese of the Midwest. The Nativity of the Theotokos Monastery in Saxonburg, Pennsylvania, north of Pittsburgh, is the first Greek Orthodox women's monastery in America, founded in 1989. The birth of Mary is narrated in the third sura (chapter) of the Qur'an with references to her father Imran, after whom the chapter is named, as well as her mother, Hannah. Hannah prayed to God to fulfil her desire to have a child and vowed, if her prayer was accepted, that her child (whom she initially thought would be male) would be dedicated to the service of God (a direct parallel to the Old Testament Hannah, whose mothering of the judge and prophet Samuel followed an identical storyline). She prayed for her child to remain protected from Satan (Shayṭān) and Muslim tradition records a hadith, which states that the only children born without the "touch of Satan", were Mary and Jesus. On the Maltese Islands, this feast is also referred to as the Feast of Our Lady of Victories (Maltese: Il-Festa tal-Vitorja) due to it coinciding with several important events in Malta's rich and diverse history. Such is the importance of this feast (both religious and historical), that the 8th of September is a National Holiday referred to by many names, mainly: victory day, il-Vitorja and il-Bambina (a shortening of Marija Bambina). Wikimedia Commons has media related to Birth of Mary. ^ "Nativity of Mary Catholic Church". ^ "Nativity of Mary School". This article incorporates text from a publication now in the public domain: Herbermann, Charles, ed. (1913). "Feast of the Nativity of the Blessed Virgin Mary". Catholic Encyclopedia. New York: Robert Appleton. This page was last edited on 23 March 2019, at 20:52 (UTC).